HICKSVILLE, Long island (WABC) -- Police arrested a man after a bizarre case of apparent road rage that left a 4-year-old injured. 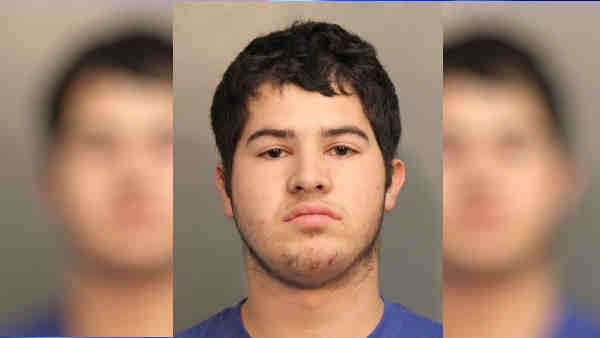 David A. Wallach, 19, of Hicksville, faces several charges, including assault and endangering the welfare of a child. He is scheduled to be arraigned Friday. Around 1 p.m. Thursday, a man was walking down Atlas Avenue in Hicksville with his 4-year-old daughter, who was riding a bicycle. They approached a driveway as a car was backing out and the man slapped the rear of the car to alert the driver as he was almost hit, according to the Nassau County Police Department. The driver of the vehicle, Wallach, got out with a baseball bat and came after the father and child, police said. The man wrestled the bat away from him, but police said Wallach ran toward the 4-year-old and knocked her to the ground with his forearm, injuring her back and neck areas. The victim picked his daughter up and brought her to a neighbor's house. But police said Wallach went to the victim's home and proceeded to break two front windows by throwing baseballs at them. When the victim's wife came outside, she was pushed into a car by Wallach, injuring her shoulder area, police said. Wallach was arrested at the scene. The 4-year-old victim was taken to a hospital for treatment.